Successfully Added SCISHION V88 Plus TV Box - 4K Resolution, 3D Movie Support, Android OS, Google Play, Quad-Core CPU, 2GB RAM, KODI TV to your Shopping Cart. The V88 Plus is another offering to the SCISHION lineup that brings great affordability and plenty of versatility for home media entertainment. With 4K and 3D video support as well as Kodi Media player and plenty of power for games and movies this compact TV box is a great way to make any HDMI screen a smart TV. The SCISHION V88 Plus media player utilizes a Rockchip 3229 quad-core processor and has 2GB of RAM as well as a Mali-400MP GPU - all this means it can easily stream movies, surf the web and handle games proficiently. You get 8GB of onboard storage as well as a micro SD card which when combined with the multiple USB offers plenty of data storage options. Take advantage of 4K resolutions and view the best sports and movies on your 4K screen. With 3D movie support you can enjoy stunning movies nights in the comfort of your own home. With the Android OS and access to the Google Play store you can stock up on games and stream all your favorite shows so there is entertainment for all the family. Built in wireless antenna gives you the freedom for your setup so this TV box anywhere around the house and still access your home network, without the need for extra cables. With 4 USB ports, SPDIF and AV out you can hook up all your peripherals such as microphones, USB cameras, game pads and controllers so you can enjoy video calls games and share all your files with the utmost ease. 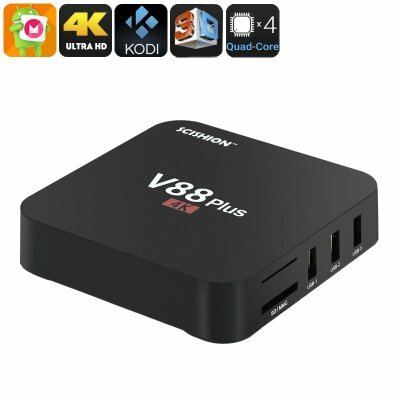 The SCISHION V88 Plus Android TV box comes with a 12 months warranty, brought to you by the leader in electronic devices as well as wholesale Android TV Boxes..
Weight/dimension is for the main item of this boxed product, to help you compare product sizes before buying: please do not base your shipping calculations on this price ­ shipping prices depend on your cart contents, shipping destination, and shipping method: please use the checkout to select options and preview shipping price for your total order. Arabic: - مربع التلفزيون الروبوت ك 4 - Chinese Simplified: - 4 K Android 电视盒 - Czech: - 4K Android TV Box - Dutch: - 4K Android TV Box - French: - 4K Android TV Box - German: - 4K Android TV-Box - Hebrew: - תיבת טלוויזיה אנדרואיד 4K - Hindi: - 4K एंड्रॉयड टीवी बॉक्स - Hungarian: - 4K Android TV Box - Italian: - Scatola di androide TV 4K - Japanese: - 4 K アンドロイド テレビ ボックス - Korean: - 4 K 안 드 로이드 TV 박스 - Malay: - Peti Android TV 4K - Norwegian Bokmål: - 4K Android TV boks - Romanian: - 4K Android TV Box - Russian: - 4K андроид TV Box - Spanish: - 4K Android TV Box - Thai: - กล่องทีวี Android 4K - Turkish: - 4K Android TV kutusu - Vietnamese: - 4K Android TV Box.